The independent transport videos cameras have returned to Portsmouth to record the bus scene as it was during the summer of 2015. 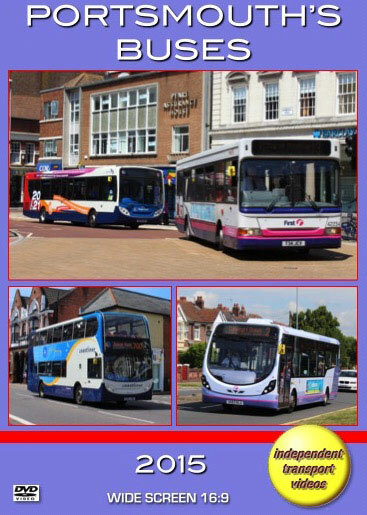 The main operators in the city are Firstbus running from their Hilsea depot and Stagecoach, the latter being formed through various takeovers and mergers from the erstwhile Portsmouth City Transport and part of the mighty Southdown empire. There has recently been an influx of many new vehicles in to both companies. More so with Firstbus, with large numbers of Wright Streetlites in either standard livery or the ‘Star’ branded livery. In the ‘Star’ livery are twenty-six buses all named after famous naval ships, twenty-three of which are named after vessels that are currently operating from the Portsmouth Naval Base. New ADL Enviro 400 double deckers operate the Portsmouth Park & Ride service in a smart dedicated livery, with one Wright Gemini Volvo B9TL on the Southsea Park & Ride. Stagecoach operates mostly Enviro 200 and 300 single deck buses of which most are route branded. Both fleets are immaculately turned out and offer the travelling public smart, modern, high frequency services. Our video programme actually starts on The Hard in Portsmouth in 2004, with a ten-minute sequence setting the scene for the main feature! Look out for Stagecoach Dennis Dart, 32429 registered 403 DCD. It is a former Hong Kong Citybus vehicle and carries the number plate from a Southdown Leyland PD3 double decker. This number plate has now been transferred to 36023, an ADL Enviro 200 which is painted in traditional Southdown colours of apple green and cream celebrating the 100th anniversary of the start of that famous company in 1915, and seen operating in the 2015 section of this programme! We start our filming of the 2015 scene on the busy Copnor Road and head towards the top of London Road, not far from the site of the former Hilsea Southdown depot, now developed as luxury apartments, and opposite to the First depot at Hilsea. Here we film the action and then make our way along London Road to do some more filming at Rudmore Roundabout. The busy Edinburgh Road and Commercial Road is our next location in the shopping area of the city. Here nearly all bus services pass through offering a lot of interest for our cameras. With further filming completed in this central area we head along Bishop Crispian Way and Queen Street to The Hard. This busy interchange is home to the Railway Station and the Gosport Ferry, and our backdrop is the HMS Warrior and the Spinnaker Tower. From here we move to Southsea. Filming takes place along Clarence Parade, Osborne Road and the Esplanade. A good selection of both fleets are seen here, and with excellent weather throughout our filming we are sure you will enjoy your visit to Portsmouth. Our programme concludes with some archive video from the cameras of Malcolm King and Joe Ward. Both photographers visited Portsmouth in 1990, which was at the time when Stagecoach was beginning to make its mark, as their first corporate livery was being introduced. We also see a number of Southdown Bristol VRs and Leyland Nationals and the final double deckers of the Portsmouth City fleet. Duration : 66 minutes (approx).